RAGGEDY ANN & ANDY 1977 Production cel of the tall ship from the sea scene. Presented on a Color Laser of the Original Background. Animation Drawing of the Pink Panther jumping into the water. Overall Size 10 x 12 Inches. 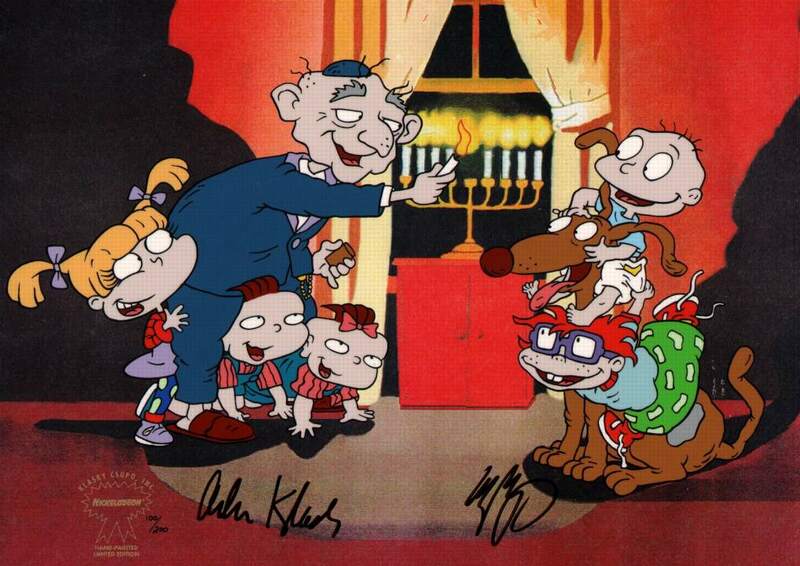 Hand-Painted limited edition cel depicting the Rugrats cast at the lighting of the menorah by Grandpa Boris. Overall Size 10 x 12 Inches. HAPPY TOTS 1939 Columbia Studios Production Cel of an Elf. Matted in its Original Mat! From a Cartoon Directed by Ben Harrison. HAPPY TOTS 1939 Screen Gems, Inc. Production Cel of an Elf. Directed by Ben Harrison. MOTHER HENS HOLIDAY 1937 Model Drawing of a Bird. From the Collection of Dave Tendlar. 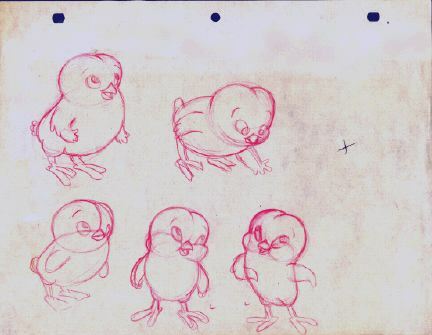 MOTHER HENS HOLIDAY 1937 Model Sheet Concept of a Baby Chick. From the Collection of Dave Tendlar. 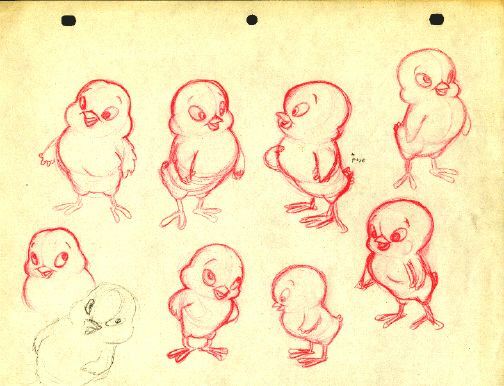 MOTHER HENS HOLIDAY 1937 Very Rare Red Pencil Construction Model Sheet of the Baby Chick. From the Collection of Dave Tendlar. This Columbia Studios artwork is impossible to find. 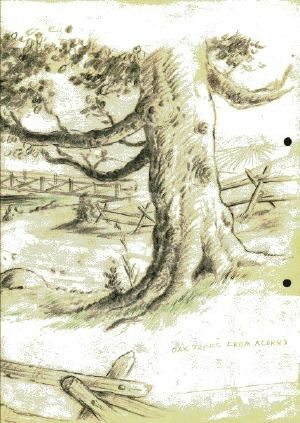 OLD OAK TREE 1930’S Early Animation Layout Drawing of an Oak Tree by a Winding Road. Columbia Studios. 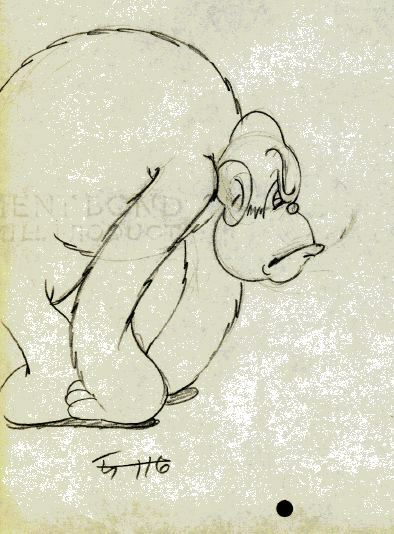 THE GORILLA HUNT 1939 Animation Drawing of The Gorilla. Drawn by Ub Iwerks for Columbia® Studios. 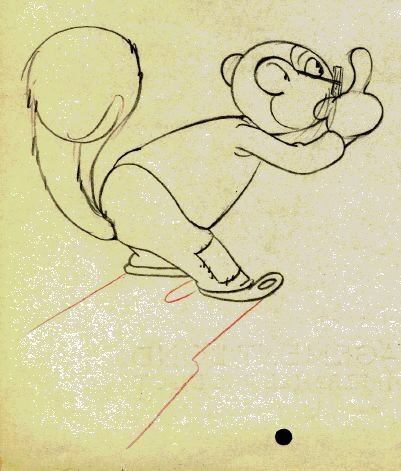 TWO LAZY CROWS 1930’s Animation Drawing of a Squirrel with Glasses. Drawn by Ub Iwerks for Columbia@ Studios. YELLOW BIRD 1940’s Production Cel of a Yellow Bird. Full Cel on 2-Hole Punch Acetate from Columbia Animation Studios. Very Rare! Presented on a Color Laser Background. THE SIMPSONS 1993 Oversized Model cel of Bart reclining. Framed (plexi damaged). DINK, THE LITTLE DINOSAUR 1989 Production Cel from Dink, The Little Dinosaur. DINK, THE LITTLE DINOSAUR 1989 Production Cel of A Dinosaur from Dink, The Little Dinosaur. DINK, THE LITTLE DINOSAUR 1989 Production Cel of a Pteradactyl Water-Skiing from Dink, The Little Dinosaur. DINK, THE LITTLE DINOSAUR 1989 Production Cel of Four Brontosaurs from Dink, The LIttle Dinosaur. DINK, THE LITTLE DINOSAUR 1989 Production Cel of Two Dinosaurs from Dink, The Little Dinosaur. DINK, THE LITTLE DINOSAUR 1989 Production Cel of Two Pteradactyls Flying from Dink, The LIttle Dinosaur. ELVIS PRESLEY - SPEEDWAY Hand-Painted Open Edition Cel Depicting Elvis Presley with Racing Helmet and Jacket. PINK PANTHER 1987 Pink Panther Production Cel Signed by Friz Freleng and Presented on a Color Laser Background. THE PINK PANTHER 1970’s Production Cel of the Pink Panther and a Man Carrying a Bale of Hay. THE PINK PANTHER 1970’s Production Cel of the Pink Panther Swinging a Baseball Bat at the Fly. From the Episode Titled “THE PINK SWAT.” Presented on a Color Laser Background. Signed by Friz Freleng. THE PINK PANTHER 1970’s Production Cel of the Pink Panther. From the Episode Titled “PINK PICTURES.” Presented on a Color Laser Background. Signed by Friz Freleng. THE THREE STOOGES 1992 Tim Hildebrandt signed hand-painted limited edition cel of the Three Stooges. Slight crease in cel. 93/275. RUGRATS 1996 Production Cel of Tommy Climbing on a Canister Vacuum, as He Gets Into Trouble in the Storeroom of the Repair Shop. Presented on a Color Laser Background. RUGRATS 1996 Production Cel of Tommy and his Mother at the Dentist’s Office. Presented on a Color Laser Background. RUGRATS 1996 Production Cel of Tommy, Chuckie, Phil & Lil, Signed by Klasky & Csupo. Damaged to Frame; Sold As-Is. RAGGEDY ANN & ANDY 1977 Color Model Cel of a Secondary Character. RAGGEDY ANN & ANDY 1977 Color Model Cel of the Parrot. RAGGEDY ANN & ANDY 1977 Color Model Cel of the Snake. RAGGEDY ANN & ANDY 1977 Production Cel of The Pirate Ship as it Sails on the Open Seas. Presented on a Color Background of a Beautiful Sunset. RAGGEDY ANN & ANDY 1977 Production Cel of the Tall Ship and Its Wake, from the Sea Scene. GREAT VALUE. RAGGEDY ANN & ANDY 1977 Production Cel of the Tall Ship from the Sea Scene. Presented on a color laser background. RAGGEDY ANN & ANDY 1977 Raggedy Ann & Andy and All Their Friends are Stunned at What They See. RAGGEDY ANN & ANDY 1977 Raggedy Ann & Andy and All Their Friends are Stunned at What They See. Presented on a Color Laser of the Original Background. RAGGEDY ANN & ANDY 1977 Raggedy Ann & Andy Ride a Strange Boat. Presented on a Color Laser Background. RAGGEDY ANN & ANDY 1977 Raggedy Ann & the Blonde Doll Peek out of a Lifeboat from Under a Tarp. Presented on a Key Color Laser Background. ERNESTINE - COMEDY CLASSICS 1979 Multi-Cel Setup of Lily Tomlin as “Ernestine,” the Nasal Telephone Operator. Production Cel is from a Comedy Classics Episode. Presented on a Color Laser of the Original Background. GARFIELD 1995 Animation drawing of Garfield and Odie. GARFIELD 1995 Production cel of Garfield holding a book. GARFIELD 1995 Production cel of Garfield juggling 5 ice cream pops. Presented on a studio prepared color laser background. Mats damaged by cutter and in need of rematting. Frame needs wire back. GARFIELD 1995 Production cel of Odie. Presented on a color laser background. GROOVIE GHOULIES 1970’s Production cel of Count Dracula presented on a color laser background. GROOVIE GHOULIES 1970’s Production cel of Frankie from the Groovie Ghoulies show. REAL GHOSTBUSTERS 1980’S Production Cel of One of the Ghostbusters’ Team on a Spectacular Watercolor Production Background! TEENAGE MUTANT NINJA TURTLES 1989 Production cel from Teenage Mutant Ninja Turtles Episode. Presented on a color laser of the original background. TEENAGE MUTANT NINJA TURTLES 1989 Production cel of the young girl presented on a color laser background. THE ADVENTURES OF ZORRO 1980’s Production Cel of the Governor. THE ADVENTURES OF ZORRO 1980’s Production Cel of the Police Sergeant. Comes with Matching Animation Drawing. THE ADVENTURES OF ZORRO 1980’s Production Cel of Zorro Fighting with the Villain. THE ADVENTURES OF ZORRO 1980’s Production Cel of Zorro in Disguise. THE ADVENTURES OF ZORRO 1980’s Production Cel of Zorro in Disguise. Comes with Matching Animation Drawing. THE ADVENTURES OF ZORRO 1980’s Production Cel of Zorro in His Night Cap and Robe. THE ADVENTURES OF ZORRO 1980’S Production Cel of Zorro Riding his Horse. THE ADVENTURES OF ZORRO 1980’s Production Cel of Zorro Riding his Horse. Comes with Matching Animation Drawing. THE BEAR AND THE KOALA 1980’s Production cel of the Koala signed by Yoram Gross.